(PRLEAP.COM) Perio Protect LLC trains dentists in the U.S. and Canada to use non-invasive prescription tray delivery for patients with gum disease. Previously these trainings have been 3-8 hours in length, but recently the company developed an express training option to convey the essence of the Perio Protect Method® in 90 minutes. The express option is designed for the dentist or hygienist who wants the fastest route possible to research-based training with significant practical application. The Perio Protect Method® combines prescription Perio Tray® delivery of medication with debridement and scaling, laser treatments, and surgery when necessary. 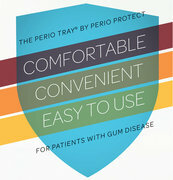 The Perio Tray has a unique seal and extension system needed to place medication deep into periodontal pockets and hold it there long enough to have therapeutic effect. Research demonstrates that the Perio Tray delivery of antimicrobials, combined with SRP, results in better pocket probing depth and bleeding index reductions than SRP alone. Sites examined include natural and restored teeth. Research also confirms patient-reported side effects of whiter teeth. The first Perio Protect Express Webinar will take place Tuesday, September 24, from 7:00-8:30pm Central. Independent private practitioner Dr. Alan Friedel will present the Express program in a live Webinar format. Having incorporated Perio Tray delivery into his own practice, Alan Friedel has a wet-gloved point of view. He will help dental professionals identify good patient candidates and the steps needed to implement the prescription trays in dental offices, with an eye on the scientific rationales for case selection. 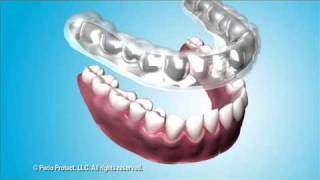 There are many benefits to adjunctive Perio Tray usage. It can be prescribed before and after SRP and for all stages of periodontal disease. The Perio Tray also delivers into both shallow and deep pockets, so the dental team doesn't have to watch disease progression in frustration before prescribing an effective adjunctive delivery. For patients with generalized bleeding or pocketing, an arch delivery technique is ideal. Perio Tray delivery offers maximum treatment flexibility. While dentists can prescribe antibiotics in the Tray for localized delivery, a low concentration of hydrogen peroxide has demonstrated efficacy. The Perio Tray is especially appreciated by patients with dental anxieties, by patients with systemic inflammatory illnesses or artificial joints, and by patients who have worked hard at oral homecare but still struggle with the disease. Patients who cannot afford surgery or for whom surgery is contraindicated have also benefited from this technology. An uptick in interest in Perio Protect training likely results from the addition of the new CDT code D5994 for a "periodontal medicament carrier with peripheral seal – laboratory processed," effective January 1, 2014. But even before this addition, dentists requested an easier transition for incorporating this treatment modality into their dental practices. Perio Protect values the feedback from the dental community and expects this training to fit the bill. The Express course tuition is $99/person and offers 1CE. For more information, call 877-434-GUMS (4867) or visit http://www.perioprotect.com/CertificationWebinars.asp. Dentists who have completed Perio Protect training confirm improved patient results, enhanced hygiene protocols, and better office production.